If the answer to this question is yes, the chances are that you need to learn about EMFs quite quickly. The information on this page may be of use to you. We hope that this page answers all your questions but should you find that you need more information on EMFs then you can discuss your specific questions with a professional EMF Advisor by contacting the EMF Helpline. You may also find our booklet EMF The Facts helpful. Electric and magnetic fields are produced wherever electricity is used – they are around us all the time in modern life. 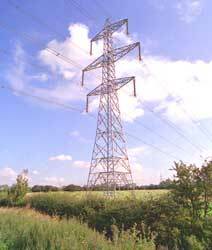 Overhead power lines – specifically, the wires, not the pylons that hold them up – are a source but they are only one source. Electric fields are produced by voltage and magnetic fields by current. Where there are concerns, they are mainly about magnetic fields. Most people get most of their exposure to EMFs from the distribution wires along the street and from wiring in the homes. We also get short-duration higher field exposures when we pass close to electrical appliances. Outside the home, we can experience EMFs in schools, factories, offices, when using electrified transport, and when we are out shopping. We measure magnetic fields in a unit called “microteslas” (µT). Directly under a high voltage overhead line, the average field would be about 5 µT. Theoretically, it could be as high as a hundred, but in practice you virtually never encounter more than 20 µT. The field usually drops off to the 0.01 µT to 0.2 µT you find in ordinary homes within about 100 m.
The evidence for this comes from epidemiology studies (the study of statistics about disease), which have found a statistical association – an apparent two-fold increase in leukaemia incidence, from about 1 in 24,000 per year up to 1 in 12,000 per year, for the children with the top half-percent of exposures. But to set against this, mice and rats don’t seem to get disease when we expose them in the laboratory, and that’s quite a strong piece of evidence against. So overall the science is uncertain. The evidence is strong enough for magnetic fields to be classified by the World Health Organization as “possibly carcinogenic”. But that’s a fairly weak classification. Because these studies only show statistical associations and do not demonstrate causation, and because the evidence from the laboratory (biology and theoretical science) is against, the risk is not established, it remains only a possibility. These are some of the key specific studies on magnetic fields and childhood leukaemia that you may hear mentioned. The “Ahlbom” study (2000) was an important pooled analysis – it pooled together the results from a number of individual studies from different countries. It really established the idea that there is a statistical association with fields above 0.4 μT. There have been other pooled analyses since which have mainly reinforced this finding. The UKCCS (1999) was one of those individual studies, conducted in the UK. On its own, it didn’t find much of an association, but it contributed to the overall finding. “Draper” or “CCRG” (various papers 2005-2014) is a slightly different study – it looks specifically at high-voltage power lines. It found an association – but one that extended too far from the lines to be attributable to magnetic fields, and which declined over the decades from the 1960s to the present. This suggests that whatever is going on, it may not be magnetic fields. And there seems to be no association in the last couple of decades. How many UK homes does this apply to? Policy and exposure limits are ultimately set by the Government. The exposure limits have “reference levels” and “basic restrictions”. Overhead lines range from lower-voltage lines (we call them “distribution lines”) on wood poles to higher-voltage lines (“transmission lines”) on lattice steel pylons. Final distribution to homes – 400 V – wood poles – not to be confused with telephone poles! But what about below the exposure limits? There is some evidence of a possible risk of childhood leukaemia below these exposure limits, at levels produced close to some overhead lines. This is just a possibility – we’d probably say the weight of evidence is against health effects – and it’s not considered strong enough evidence to restrict such exposures. It is for each person and family to decide for themselves how you feel about this based on the evidence. Sometimes, an automated online environmental search for a property may report the presence of a power line – see more on these and how to interpret them.